On all trips Chaperones are available at an extra charge of $15.00 per person. Playable up front as bus arrives. Will be split with tour leader, Bus Driver & Staff! 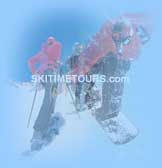 Lift Tickets, lessons and ski or snowboard rentals (available at extra cost). Round Trip Transportation on charted buses with video VCR - TV's and Lavatory Equipment. Two (2) nights lodging at the COMFORT INN AND SUITES in Plattsburg, NY. Saturday night dinner with a wide choice of Beef, Chicken and Seafood dinner at Perkins Restaurant which is located on the premises. Free use of ECLIPSE Fitness and Spa. The health club is the best equipped contemporary designed health club. Relax in the sauna, steam room, or have a massage at reasonable rates and juice bar. Free use of the INDOOR WATER PARK. Play around in our indoor water park with two (2) waterslides - 105' and 80' ride lengths - and splash into the pool. Use of the FUNZONE ENTERTAINMENT CENTER. The Funzone is an indoor 6,000 square feet of fun indoors. Inside is a 50+ game arcade, a 9-hole glow in the dark miniature golf course, a batting cage, 5-unit electric bumper car area and a Papa John Pizza dining area. Free entrance to LEGENDS LOUNGE. Large screen TV's for sports fans with a fireplace. Shopping Malls walking distance from hotel. Personalized itineraries of daily activities. Pre-registration for hotel on bus. 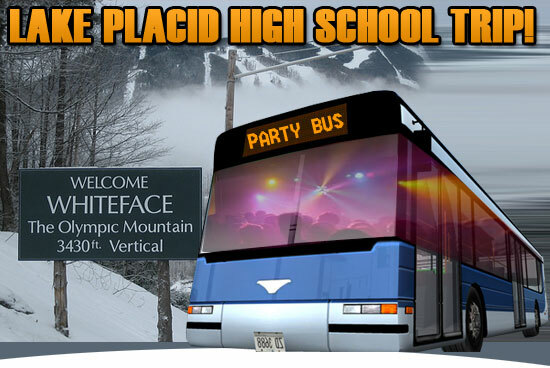 FREE transportation to and from slopes for skiing, snowboarding and Optional activities. 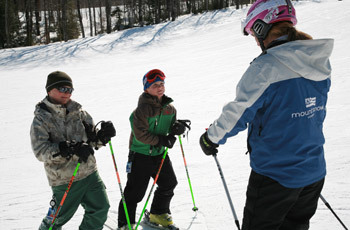 Non-stop optional activities for non-skiers (available at an extra charge, weather permitting). Free hospitality counter at front desk where you can talk to host about activities available. Rates are based on groups of 45 or more people. Add $15.00 per person for reservation of less then 45 people Add $25.00 per person. Groups Less than 30 people Add $30.00 per person.